Our preschool storytime is on Wednesday, so this week we celebrated the spirit of Thanksgiving by being thankful. Because of the age of story time kids, I use books, stories, and songs that focus on this aspect of the holiday, along with the traditional foods served during the holiday, instead of the complex story about the relationship between the Pilgrims and Wampanoag. 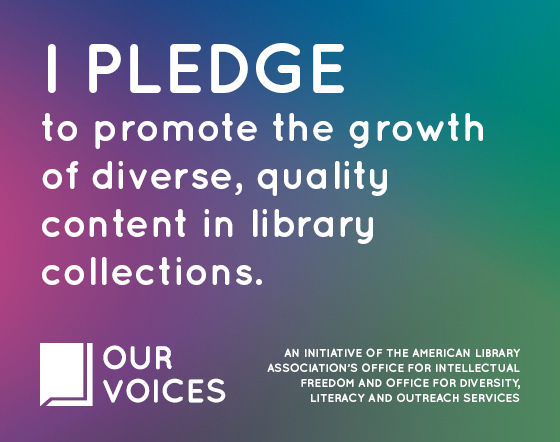 We focus on Native Alaskans, and Native Americans in general, during other programs and displays where we address Native American history and modern contributions as part of Native American Heritage Month. Thanks to Mel Depper for these great thankful book suggestions! Many of these would work throughout the holiday season. I am thankful for my hair because it makes me unique. I am thankful for underwear because I like to wear it on my head. 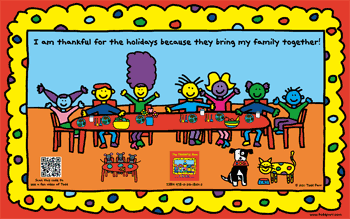 As Mel mentions, this colorful book is wonderful because it not only says what a child might be thankful for, but why. All of the mentions are child-centric and include material and non-material things. This book would work a variety of holidays or themes. 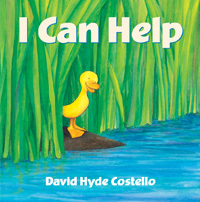 Book: I Can Help by David Costello (Farrar Straus Giroux, 2010). This book is a sweet story with simple text and lovely illustrations, just the right length for preschoolers! The chain of events with repeated problems and solutions makes it is easy for kids to practice their prediction skills. “I can help!” and “Thank you!” are repeated throughout. I heard lots of please and thank you’s during the rest of storytime after we shared this book. Coincidence? Before our last book, we did some wiggling and stretching. To shake things up a bit, I also used the felt board to tell the story of the Five Fat Turkeys. I love these goofy little turkeys! 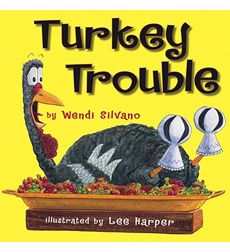 The felt board story and this book are very similar, so the kids once again were able to predict the events with ease. I left today’s books, and the felt board pieces, out for families to share during craft time or check out for reading at home. Need another book suggestion? Try Bear Says Thanks by Karma Wilson and Day by Day by Susan Gal. We ran out of time for these, but I’ll be adding them to storytimes in the future. I found this craft at Sturdy for Common Things. While I assembled more of this craft than I normally do, the result was well-received and let kids and adults focus on decorating and articulating what they are thankful for. It was worth it! The families were happy to have some decoration to add to their celebrations and the kids were proud to share what they were thankful for. I had most of the materials on hand, but I had to improvise with the pumpkins (Rebecca used stickers) and turkeys. I also want to say thank you to a local elementary school for letting me use their die cut machine to cut out the leaves! It saved me a lot of time! In addition to the clipboard craft, I also had a station set up for play dough. I had a few cans of orange, green, and red play dough set out along with some seasonal cookie cutters I found on a clearance shelf at a local store. The extra station was a welcome activity for several families and working with the dough is great for kids’ fine motor skills.